I must profess that I am not a regular headphone user. I have always preferred the more natural presentation that you tend to get with a good Hi-Fi with the acoustic subtleties, caused by the room acoustics. However, the new Quad ERA-1 may well change my opinion. The ERA-1 features a 20-Ohm impedance,m108dB sensitivity and a 10Hz~40kHz frequency response. It comes with two sets of ear pads (one synthetic leather, one genuine sheepskin) a fitted case and detachable (socket-fitted) two-meter cable with 3.5mm jack and 6.3mm adapter included. Build quality is excellent, with the ERA-1 featuring a comfortable headband and a healthy dose of metal-alloy and plastic throughout its chassis. The ERA-1 fits comfortably and snugly. Having the choice of pads is surprisingly useful, personally, I preferred the comfort of the sheepskin pads. The sound of the ERA-1’s is classic Quad: Warm and musical. Possessing superb bass control and extension, combined with tremendous detail and spatial separation. £599 is by no means cheap, however, anyone looking for a pair of high end headphones, should give these Quad ERA-1 headphones some serious consideration. We have a demonstration pair here at Audio T Oxford, so please do come and have a listen for yourself. With the clocks about to go back, and the latest series of Strictly Come Dancing well underway, you may feel that it’s time to consider an antidote in the form of a pair of headphones. 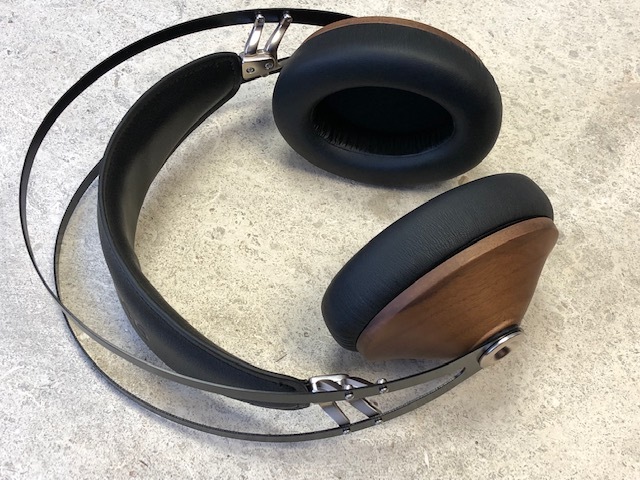 Here in store we have a selection of headphones of the closed and open back varieties, and in this blog we thought we would focus on a couple of models which might help you through these difficult few months. Antonio Meze’s company is based in Baia Mare, Romania and has been making headphones since 2009. The 99 Classics were launched in 2015 and have been making waves in Head-Fi circles since then, for a number of reasons. For a start, they are very nicely made from good quality materials and are assembled using old school techniques, which means that any maintenance or repair is a straightforward process – no glued components to separate. The ear cups are beautifully turned from solid walnut which gives a touch of class; rare for any headphone, let alone those which sell for such a reasonable price. 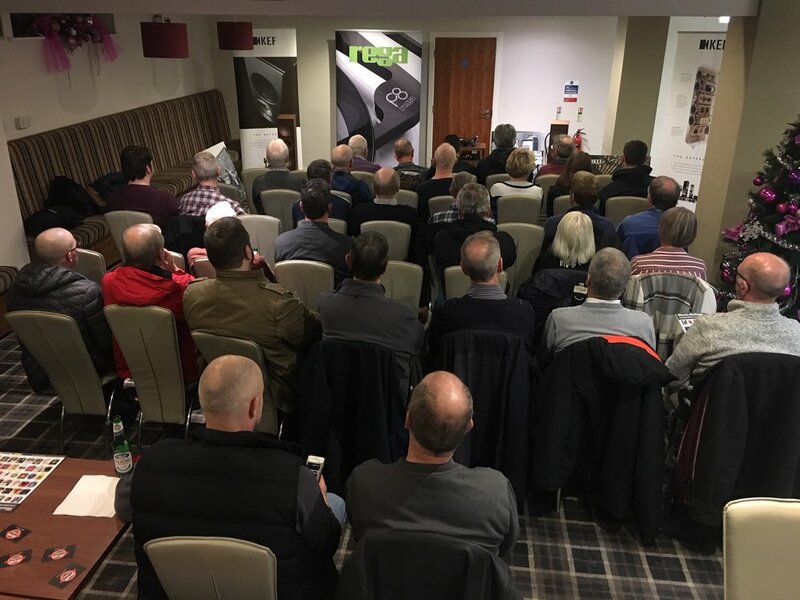 The self adjustable mechanism means they are very comfortable on heads of all shapes and sizes; they come with a useful set of accessories and, most importantly, sound extremely entertaining. They are a closed back design so isolation from ambient noise is good; sound staging is a little more restricted than one would expect from an open back pair but there is still a pleasing openness about the midband and plenty of treble detail without the upper frequencies becoming painful or intrusive. Bass (particularly the lower mid bass region) is particularly potent which makes these ‘phones really good for lovers of music with oodles of low end, and it also gives a pleasing richness to classical and acoustic music. In reality, pretty much anything sounds fun and engaging through these wooden gems. They sell for the princely sum of £269 and are available in either Walnut/Gold or Walnut/Silver finishes. To make the deal even more impressive, if you buy a pair from us you will receive a free pair of Meze 11 Neo in-ear monitors which retail at £49. We currently have stocks in both finishes. If you would like the function of the very impressive 99 CLASSICS at a lower price point, the 99 NEO might fit the bill. They are very similar in construction but are made from ABS plastic to keep weight and costs down. Although not quite as natural sounding as the Classics, they are really impressive with more modern and electronic music as the low end has even more heft so you have a choice of flavour. They come with a similarly good quality case and set of accessories, and sell for just £189. Again, we have stocks in store. 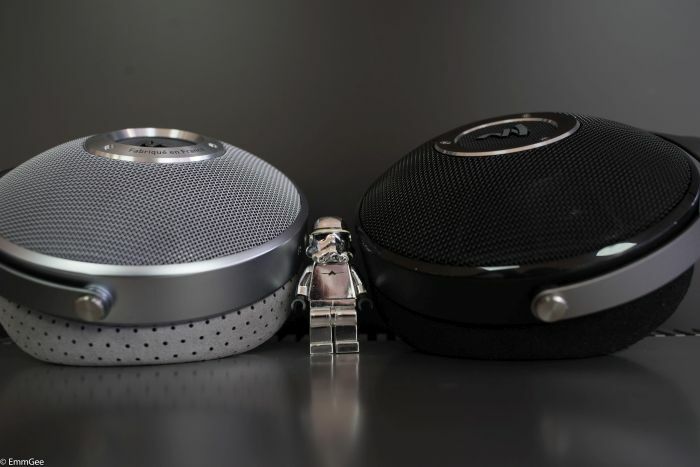 Both these sets of cans have a low-ish impedance and 103dB efficiency so work perfectly well connected directly to a phone or a digital audio player (DAP). However, to really get them singing, you could think about partnering them with the fabulous Chord Electronics Mojo DAC/Amp. This little marvel will drive these (and indeed most other) headphones to perfection, and you will thus be insulated from anything the TV can throw at you. Turn it up loud enough and you might be able to ignore all the Brexit arguments too. Come on in and have a listen - Simon, Gareth - Audio T Reading. 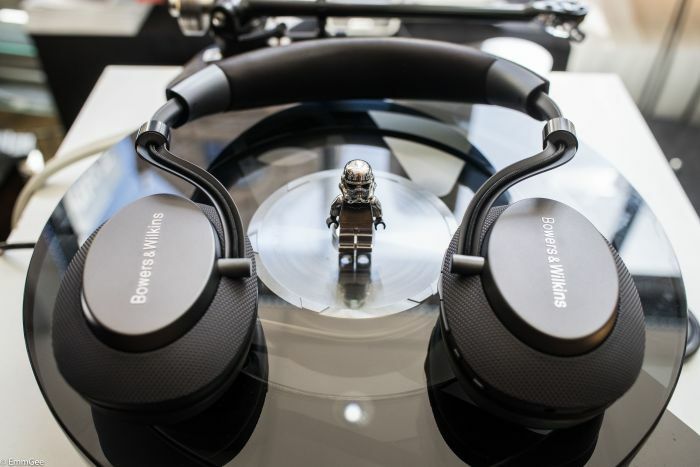 Bowers & Wilkins have launched a brand new pair of wireless noise cancelling headphones, called the PX. They are available in a space grey and a soft gold finish. What's in the box? The Bowers & Wilkins PX come shipped with a nice case, a usb-cable for charging and a 3.5mm to 3.5mm cable so you can use them wired to your phone or tablet, just in case you run out of battery power. The 40mm full-range drivers are angled inwards for better sound performance and are hidden under the magnetic ear pads. We charged them out of the box and not long after we are able to have a good listen. They are very light, comfortable and sound amazing. We paired the B&W PX via Bluetooth to an Android phone and later to an Apple iPad and it paired within seconds. Music from Tidal HiFi, a music streaming service, was the first we tried and wow, the PX’s soundstage is big and open and they can go fairly loud without any hint of distortion. Play "Till Tomorrow" of Yello's "Touch Yello" Album or "Hey Laura" of Gregory Porter's "Liquid Spirit" Album and you know what I mean. The built in proximity sensor called 'Wear Sensor', which stops playback as soon as one ear cap is lifted or when you take the headphones off. Put them back on and playback continues - it's a nice feature when someone wants to talk to you. This option can be switched on or off via the PX set up app if you prefer. How well does the noise cancelling work? 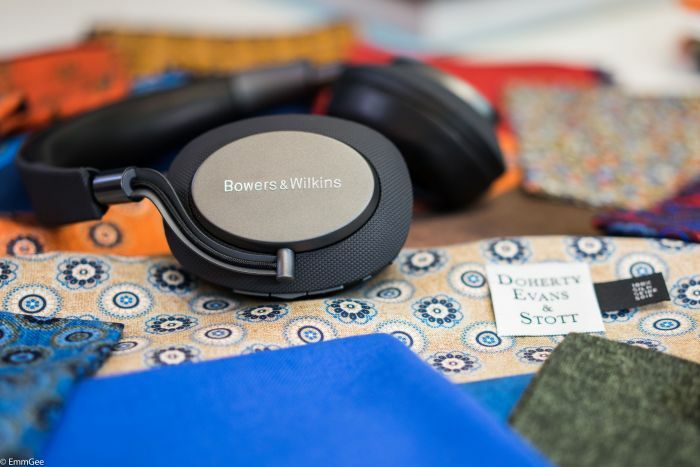 Bowers & Wilkins have designed an app (Bowers & Wilkins Headphones) available for the Android Play Store and Apple App Store to set up the noise cancelling for the PX. Open the app, touch the volume + button on the PX's and you are ready to go. Now you see a button called environment filter, switch it on and this gives you the choice of 3 settings - Office, City, Flight and Voice Pass-through if you prefer to hear a bit more what is going on around you. The noise cancelling works really well and it is up to you if you use it with music or just to cancel off the noise around you whilst on a long-haul flight and you want to close your eyes for a while. 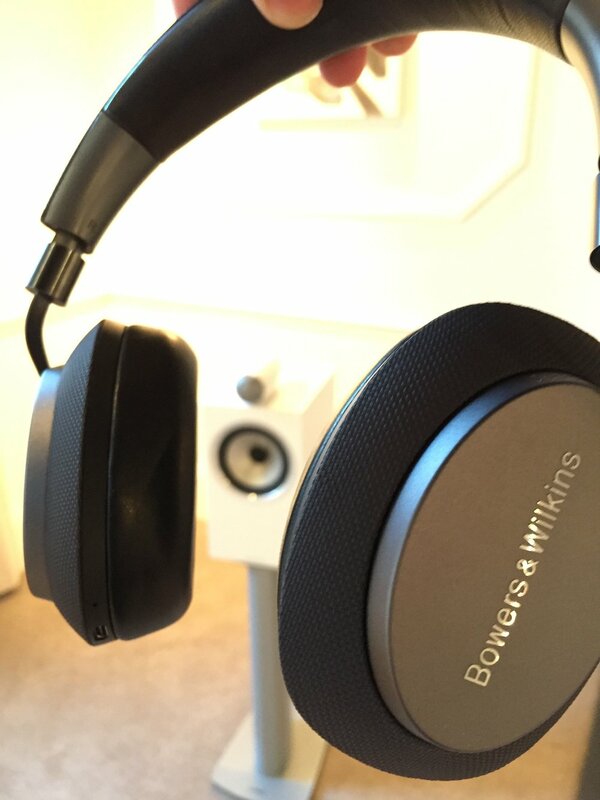 All in all we are very impressed with the build and sound quality of these stunning Bowers & Wilkins PX headphones. Please feel free to come in for a listen. Thank you very much for reading our blog and we hope to see you soon. The Pioneer SE-Monitor 5 headphones are the new closed-back premium headphone from the Japanese electronics company. They compliment the excellent open back SE-Master1. Great build quality adds to the appeal here, not only do they sound great but look good too. The magnesium alloy frame and the leather headband secure the headphones firmly to your head. Maybe a tad weighty, but very comfortable all the same. The copper ring on the capsules and copper coloured plugs on the braided headphone cable add that extra bit of class to the Monitor 5's. The elegant new Pioneer SE-Monitor 5 headphone. This beautifully constructed headphone exudes quality. The headband adjustment is reassuringly solid. Magnesium alloy and leather!! Lovely. Enter Chromey!!. Those velour headphone cups look really comfy Chromey, and did you know they also come with an extra set of leatherette cups to go with your tight leather pants. splendid. The leather headband looks and feels great. The 3.5mm jack allows to you disconnect the headphone cable and use a highend aftermarket cable. The SE-Monitor 5's sound like a £1000 headphone should, well defined bass that doesn't bloat and stays in check is welcome for a closed-back headphone. The midrange is very well controlled and isn't shouty at all, meanwhile the treble is also lush and well detailed with a hint of warmth. Overall, the stereo image produced by the SE-Monitor 5's can't be faulted and is very accurate. Fancy a try ? well, why don't you do like Chromey, and zip into Audio T Manchester and give the Pioneer SE-Monitor 5 headphones an audition. We have a dedicated area for our headphones where we use a headphone amp, you can also plug the Pioneer's directly into a portable device such as a phone or a portable audio player if it's how you roll. Munir, Mike, Dave, Simon and Haden will be on hand to help. 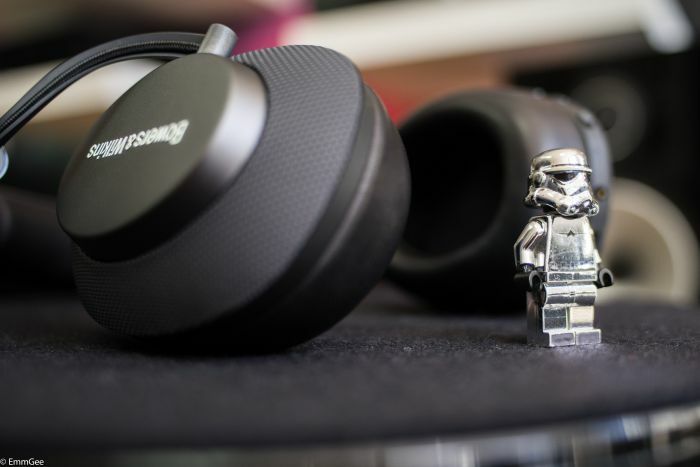 Then the new NightOwl Carbon headphones are for you. A hugely talon-ted (he he..) headphone with a choice of ear pads to offer a comfortable and different listening experience. The protein Leather pads seal tighter for better isolation and improved treble clarity and the Ultra suede earpads breath freer for greater comfort and enhanced bass impact. The cable has multiple functions including play, pause, call answering, track skipping and returning to previous track. Thus making them suitable for on the go listening as well as reference listening at home. They also include a Direct silver 6.3 plug adapter. For a closed back design they offer similar openness and clarity to most open back headphones. Impressive sound quality aside they are tremendously comfortable making long listening sessions even more satisfying. A good companion for the NightOwl is the Chord Hugo DAC in conjunction with your Hi-Fi or mobile device. Priced at £599 the Audioquest NightOwl Carbons are a must listen, Swoop in to Audio-T Portsmouth and try them on our dedicated headphone listening system, or at home over a weekend on your own system.